This class will give you the skills to transform your artwork into a beautiful edible centerpiece for a party or wedding. We will be exploring different ways to bring artistic creativity to the dessert table by applying it to an edible canvas. The first canvas will be rolled fondant. You can use this skill to paint on cakes that are covered with fondant or cut out a shape, such as a circle as I demonstrate, to apply overtop buttercream on a cookie or cupcake. The second canvas will be royal icing. We will be exploring this technique on cut-out cookies with a smooth surface such as sugar cookies. 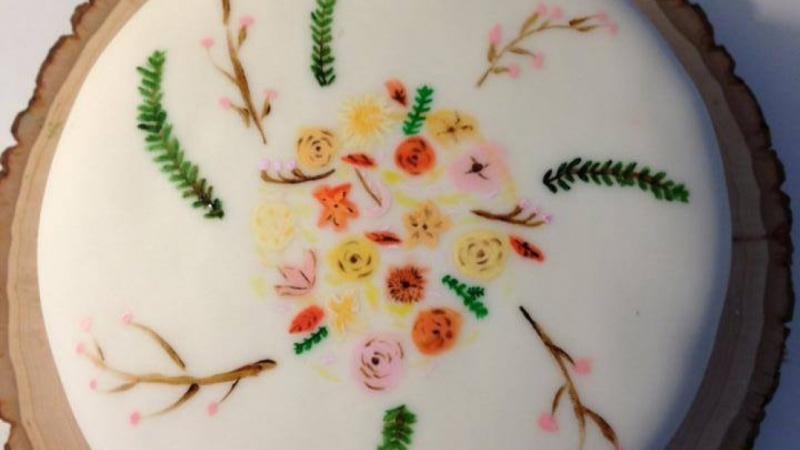 No matter what you decide to paint, this technique is a great way to personalize your dessert creations for a lasting impression! Choose a pattern, design, or quote that inspires you. A greeting card or invitation can conjure great inspiration allowing you to pull elements of the design to incorporate in the overall theme for the party. Utilizing the techniques we learned in class, sketch out your own design on a piece of paper and practice your technique to develop the muscle memory. You will then do your finished piece on either a royal icing-covered smooth cookie (such as a sugar cut-out) or on a fondant-covered cake/cupcake. Make sure to think through the size of your edible canvas. If it is a cookie or cupcake, and you've chosen a large pattern, practice incorporating all the elements you want to be on your design in the small space. Remember to use food coloring GEL, not the liquid. Trying to find a creative outlet after having her first child in 2012, Brooke enrolled in a local cake decorating class. She fell in love with the concept of cake decorating and baking however, the class left her feeling hungry for more modern and innovative design concepts. With the limits of having an infant, Brooke began researching and teaching herself how to achieve the modern looks she thought up in her head at home.